Ever feel like you’re talking to a brick wall? You’re the only person carrying the conversation and you get no response? You’re not alone. As we make our way upstairs in the Sound Relationship House, we hit the third floor, Turning Towards Instead of Away. 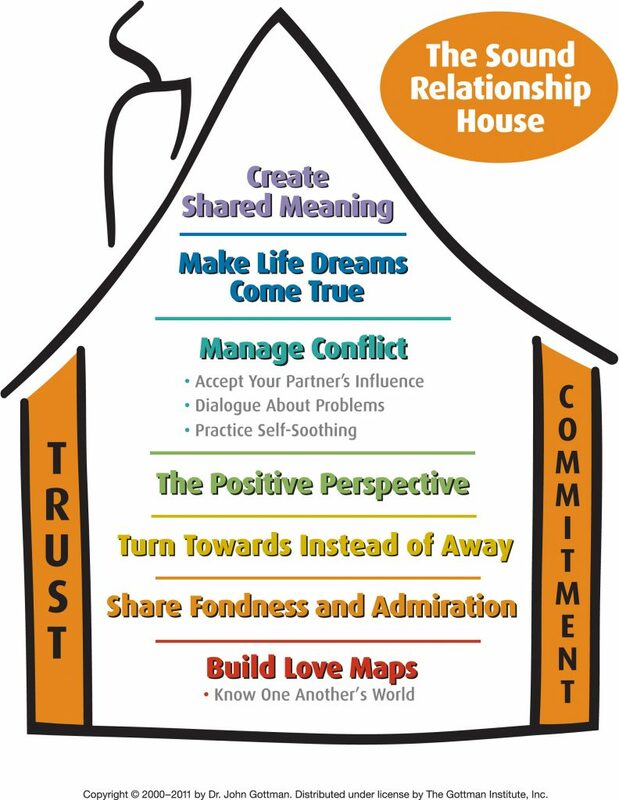 Notice that the first three floors are the means for accessing all of the floors above, that means if you want to manage conflict well and be on the same page about roles and goals, then you’ll need to take care of your couple friendship first. Now, I know you’re all wondering what this turning business is all about. Is it some kind of fun dance move that magically saves crappy conversations? Sadly, no. That would be too easy and so much fun, right? Hmm, maybe you could incorporate a dance move, I’ll let you decide. What the Gottman’s learned when they did their 40+ years of longitudinal research is that happy couples respond positively to their partner’s attempt to connect with them. They also found that struggling couples often turned away from each other during these same opportunities for connection. Here’s what it looks like in real life. Hubby says, “Oh, you wouldn’t believe the day I had at work today! Those people were in rare form!” and his partner turns toward him and replies, “Oof, that sounds like there’s a story behind it. Let me hear it.” Now the husband feels listened to, heard, and cared about. Alternatively, if his partner replied with, “Look, I don’t have time to listen to your problems right now. I have enough of my own!” then that would be turning away. There is also a small attempt to connect here as well, the mention of their own problems. If hubby sees it as an opportunity to connect, he might say, “Oh no, babe, what’s going on with you?” Even in conflict or a negative interaction, there is still opportunity for connection. Later this week, I’ll share some more ways that you can look for these connection opportunities as well as specific tips on how to respond with Turning Toward. Follow me on Instagram and Facebook so you can get notified as well as access to bonus content!